It's back to school season, and with the best intentions I haven't done anything new for you. Sorry. I know you feel hurt. I feel the hurt too. However, I wanted to share these oldies but goodies with you. 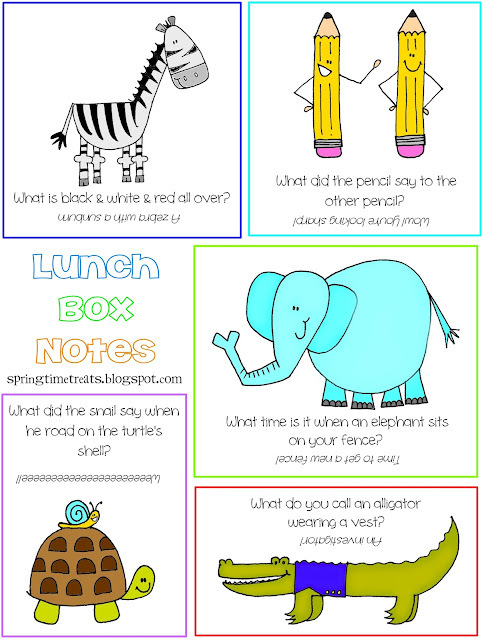 Lunch box notes! These cheesy jokes go great in your child's school lunch box, or left on their pillow. I'm all about being cheesy. Here is the original link with pictures that show the jokes better. (I'll just tell you now, they are really good). But these next ones are my favorite. Chuck Norris Facts! These are lunch box notes for teenagers, spouses or my 7 year old son who informed me is too old for little kid jokes. Check out the original link for other awesome ideas on how to use these. Seriously, I really love the idea "Random acts of Chuck Norris" or where you attack someone's door with these jokes and post "You've been Chuck Norrised"